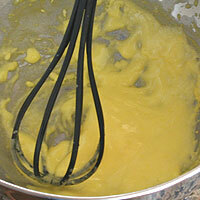 Hollandaise is great served on eggs, fish, or vegetables. It is particular, but not difficult if you follow the instructions exactly. Melt butter in microwave and set aside. Fill a pot about 1 inch deep with water. Bring to a boil, then reduce to a simmer. In a stainless steel bowl, whisk yolks, lemon juice, and water. I have tried twice to use an aluminum bowl and the sauce curdled. The only stainless steel bowl I have is my kitchen-aid bowl. Even though it's large, it works just fine. 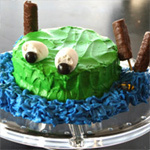 Place over pan of simmering water and continue to whisk constantly until frothy and pale yellow. If using a thermometer, it should reach 160 degrees. 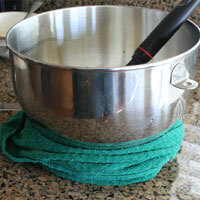 Wrap bowl in a warm damp towel. 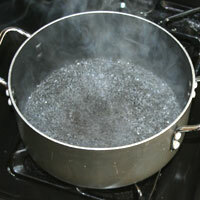 Make sure the water is simmering not boiling. If it boils, it will cook the mixture too quickly and not be smooth or able to thicken properly. Not only is 160 degrees the temperature at which the eggs emulsify, it is also the point at which they are safe to eat. Between 160-170 degrees is the point where the eggs start to stick to the sides and solidify like scrambled eggs. 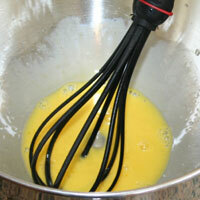 Remove the bowl immediately if this starts to happen and whisk constantly. Slowly whisk in melted butter. Season with salt, pepper, and cayenne. 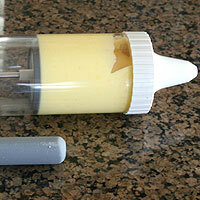 Transfer to a serving bowl, decorator tube, or a re-usable squeeze bottle. 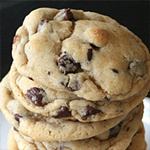 Use immediately or keep at room temperature up to an hour. 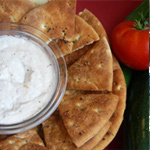 You can refrigerate the leftover, but do not reheat, allow it to come to room temperature before serving. Heating or re-heating the sauce after it's made will curdle it. Serve it warm or at room temperature. If you won't be using it within an hour of making it, refrigerate it then allow it to come to room temperature before serving. It's best served fresh though. 1. Melt butter in microwave and set aside. 2. Fill a pot about 1 inch deep with water. Bring to a boil, then reduce to a simmer. 3. In a (1)stainless steel bowl, whisk yolks, lemon juice, and water. 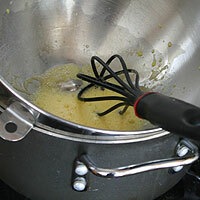 Place over pan of (2)simmering water and continue to whisk constantly until frothy and pale yellow. If using a thermometer, it should reach (3)160 degrees. 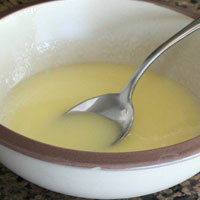 Wrap bowl in a warm damp towel and slowly whisk in melted butter. Season with salt, pepper, and cayenne. 4. Transfer to a serving bowl, decorator tube, or a re-usable squeeze bottle. 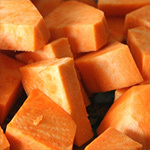 Use immediately or keep at room temperature up to an hour. You can refrigerate the leftover, but do not reheat, allow it to come to room temperature before serving or it will curdle. 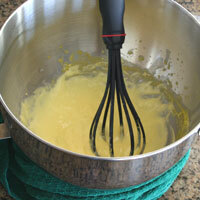 Most hollandaise recipes make double the amount. I never seem to use that much. Unless you're cooking for a large crowd stick to this recipe. 1. I have tried twice to use an aluminum bowl and the sauce curdled. The only stainless steel bowl I have is my kitchen-aid bowl. Even though it's large, it works just fine. 2. Make sure the water is simmering not boiling. If it boils, it will cook the mixture too quickly and not be smooth or able to thicken properly. 3. Not only is 160 degrees the temperature at which the eggs emulsify, it is also the point at which they are safe to eat.